A Jillian Vance Design: You're A Star! The little balloons are so fun to make. I used AJVD flat sequins inside. The background was inked with Distress Inks and and misted with Perfect Pearls spray. I then cut it with the Scattered Stars Strip Die. 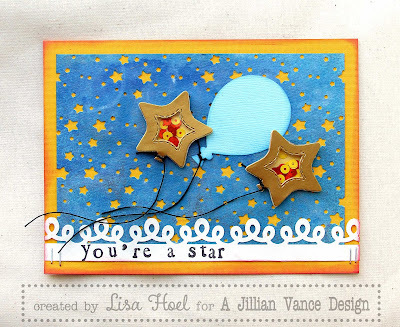 The loopy border was cut with a paper punch from my stash and for the sentiment I used an old alpha stamp set I have. Thanks for stopping by! Go get crafty and see what you can make to bring a little bit of happy into someone else's life.